What does this document say about Ol’ Myrt’s ancestor? What other record groups should Ol’ Myrt consider after analyzing this document? This is a Civil War Pension card. We are looking at a digital image of that card. Additional Service A 17 V.R.C. “Civil War Pensions; Organization Index to Pension Files of Veterans Who Served Between 1861 and 1900”, digital image, The National Archives (http://www.fold3.com : accessed 31 October 2014); entry for William H Phillips (Co K, 19 Reg, Ind Inf); citing: Civil War Pensions, Pension applications for service in the US Army between 1861 and 1900, grouped according to the units in which the veterans served; NARA T289. no roll number cited. The first thing I noticed was William H vs William D. Wonder if +DearMYRTLE gave that to us as a hint. What this told me was the soldier’s name was William H Phillips and that he was married and left a widow. He was a Private, in Company K, of the 19th Regiment, Indiana Infantry. He Died 1/21/1921 in Knoxville, Iowa, and his widow filed for the pension 3/12/1921. So far, the information appears to be OK, but…. One thing that caught my eye was the Term of Service, there we no dates. So, I searched to see if there were any Civil War Service Records for William H Phillips that fit the information I had so far. There was no indication in the Civil War Service Index – Union – Indiana for him, but there were 7 entries, none this William H. The question so far is, Did he serve and when did he serve? Not sure what the A 17 V.R.C. means, yet. I have been looking at Civil War Records on Ancestry.com, and where I would normally go from what I have so far, would see IF I can find HER pension file. And I found her pension at: U.S., Civil War Pension Index: General Index to Pension Files, 1861-1934 for William H Phillips. The numbers matched exactly, as I have seen before. It’s a different card, but should have the same numbers and certificate number. It did. The widow’s name is Louisa Phillips. She filed for the pension in Iowa, where he had died. That A 17 V.R.C. is also on this pension record. Two documents with the same information. 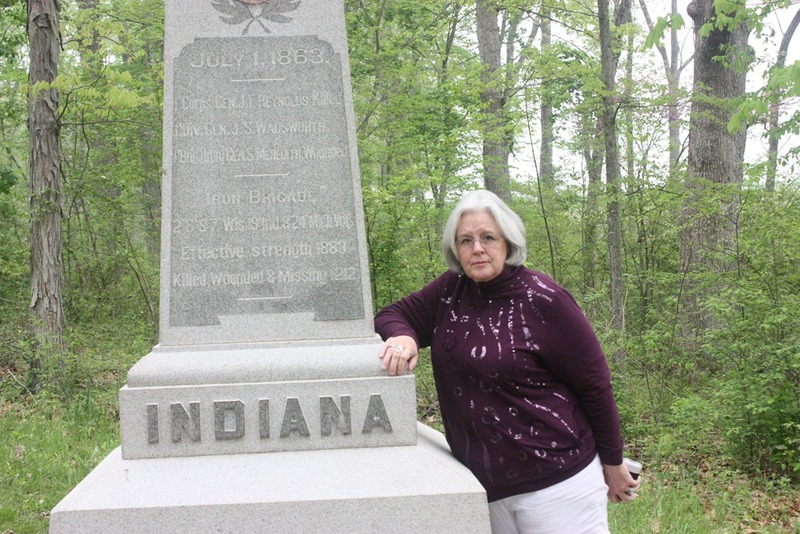 My next stop was to see IF I could find any more information on the 19th Indiana Infantry Regiment, as I had a hint something was coming. So I went to Wikipedia. Having been on a brief Civil War research trip with our spouses, I took this picture at Gettysburg in May. The Iron Brigade. I knew there had to be a connection. BUT, I took my next step to see what else I could find out about the 19th. Before I take my next step in research, I need to mention that the Iron Brigade was involved, in Gettysburg, on Culp’s Hill on 3 July. 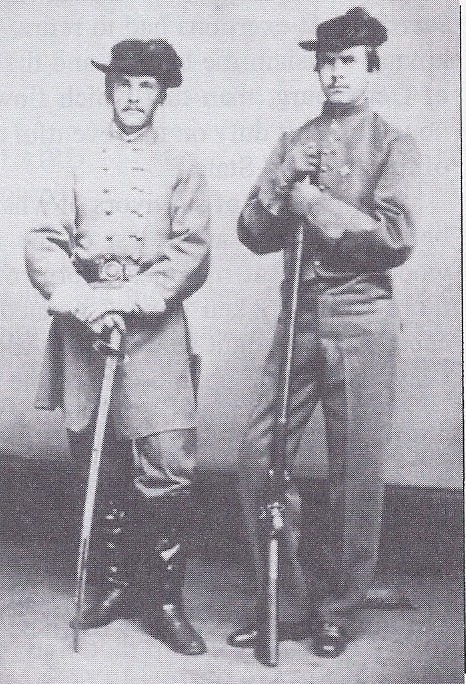 I also had a Confederate soldier, Ridgely Howard, in that SAME battle and he was wounded in the thigh at Culps Hill. Not in the same part of the battle, DearMYRTLE’s soldier was at the other end of that battle, as there are monuments placed where the units were fighting. Pieces of David Ridgely Howard’s story is in a PBS film on Gettysburg. 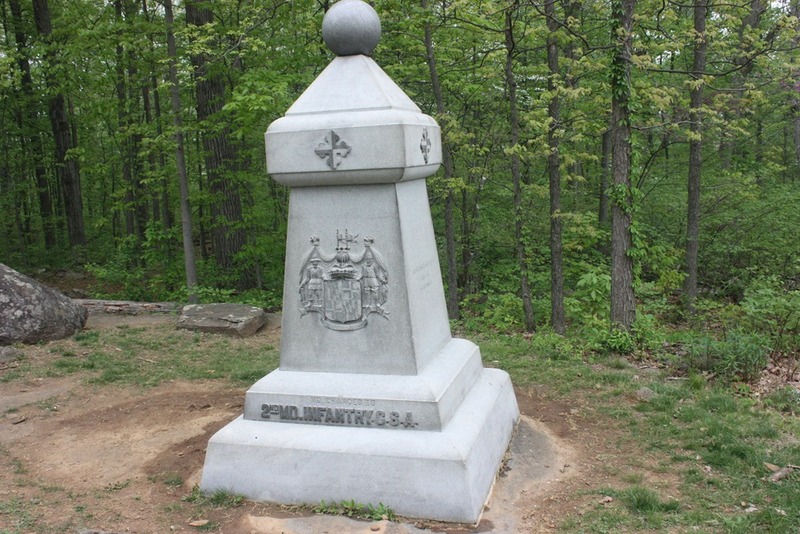 This is the monument for the 1st Maryland. In William Henry Phillips Find-A-Grave memorial, Find A Greave Memorial #58768920, DearMYRTLE published the details of his pension files, that he served through 1864. So, Was HE, William Henry Phillips, at Weldron R.R. in that battle? MY Ridgely Howard was wounded for the 2nd time at THAT battle. This time, “wounded in action – upper portion of right thigh, amputated. David Ridgely Howard lived until 23 December 1927 and is buried in Green Mount Cemetery, Baltimore, Maryland. Last weekend’s “day trip” became two Day Trips. Unfortunately, Patti was not up to the trip, but we agreed that I would make the trip to Frederick, Maryland and the celebration of Special Orders 191 (will blog later on that). Our plan was to spend the night, visit Worthington Valley, then proceed to the Worthington Reunion. (already blogged about that). It was hot, but there was time. Since doing my research last summer (Inferential Genealogy), I wanted to Visit Fort McHenry. The Howard family played a role at Fort McHenry early in the Civil War. While doing that research I realized that Frances Scott Key was in my family file. I had known of other Worthington / Key interactions in the past. There is a house in Anne Arundel County that belonged to Key and Worthington. (but that’s another story). As you may be able to tell from the above picture, that is was a beautiful day. 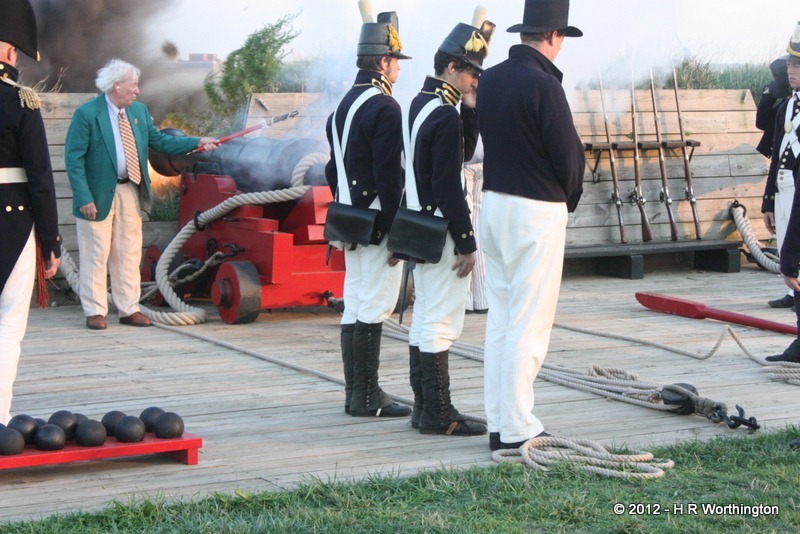 Fort McHenry has programs in the evenings on the weekends, War of 1812 Twilight Tattoo. Why not …. it gave me a chance to re-visit the Fort, as it’s been a number of years since I last was there AND had no pictures. Great day to visit and to that Pictures. 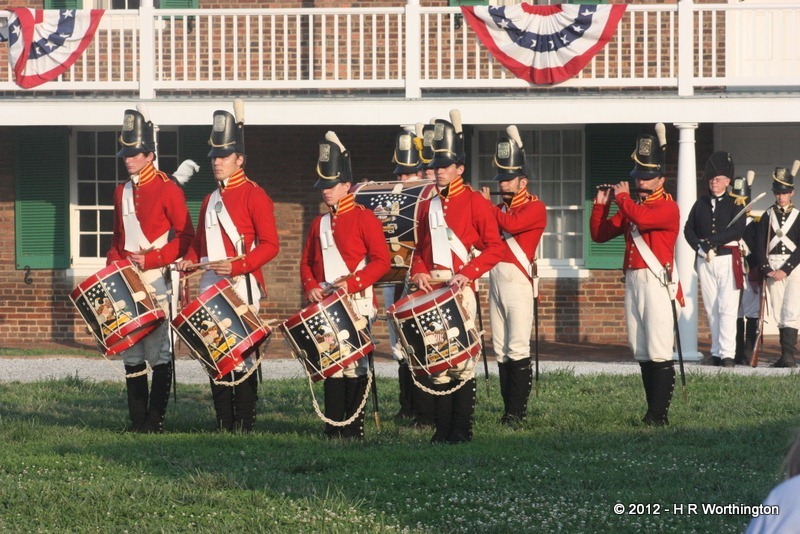 As may have been a tradition at Fort McHenry, in the evening, there was a gathering of the troops (Tattoo), and as was presented this evening, a band was there, along with the local “ladies”. 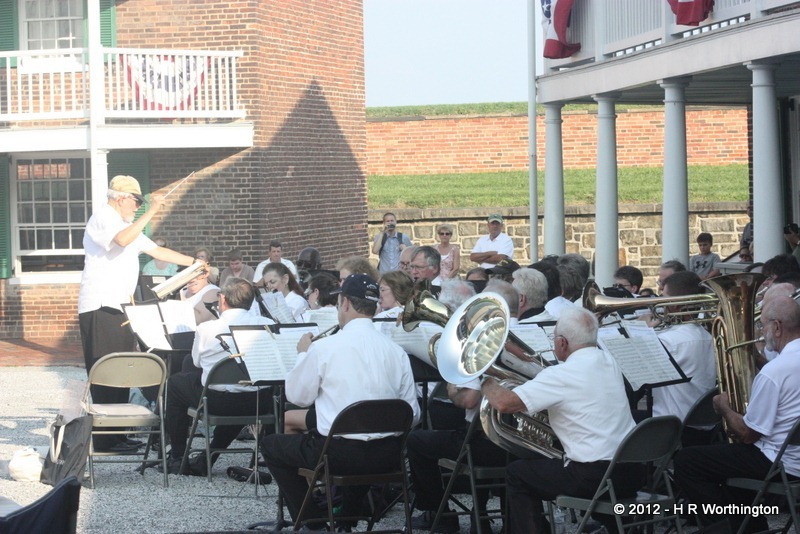 The Chesapeake Concert Band and the Fort McHenry Fife & Drum Corps played for those in attendance. 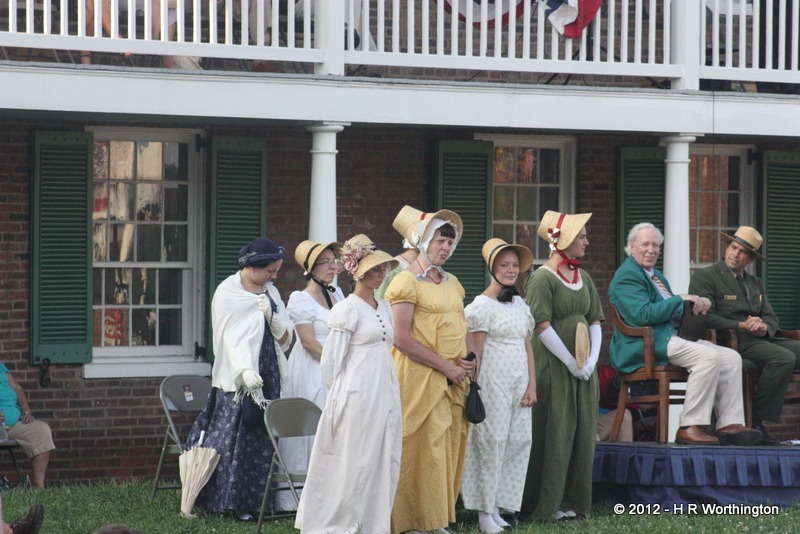 Period music was presented, including some music specifically created for Fort McHenry. The Traditional Canon Salute was included in the ceremony. So why all the fuss about Fort McHenry and Frances Scott Key? 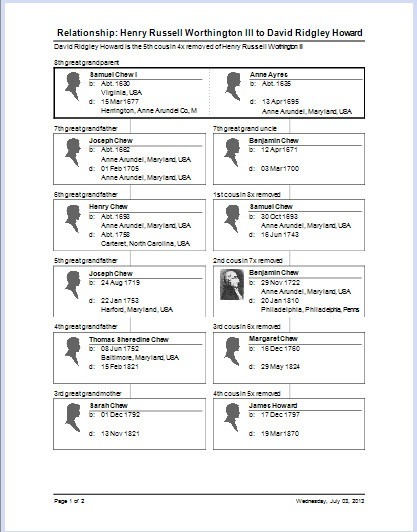 According to my database, he was the Father-in-law of my 10th Great Grand Uncle. What ??? OK, he’s distant, but still related. 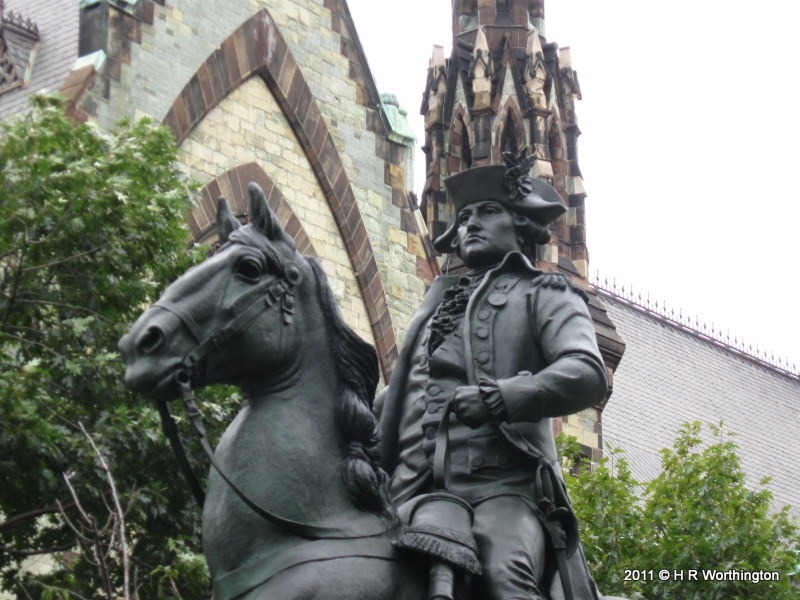 Looking at HOW we are related, I run into TWO, not one, but TWO Revolutionary War “Hero’s”. As reported on this Blog, John Eager Howard, grandfather of David Ridgely Howard and McHenry Howard, of Civil War fame, but also Ann Cooper Whitall, wife of James Whitall. (The Battle at Red Bank, New Jersey). The Whitall House it across the Delaware River from Fort Mott. Another visit to the Whitall House is in order. In this one line, I have Revolutionary War, War of 1812, and the Civil War hero’s. I was doing a little more research ON the War of 1812. For Military Records, my first stop is normally Fold3.com. What I found was link to War of 1812 Pension and Bounty Land Warrant Application Files. What did that record have to do with me. There wasn’t too much of interest to me, BUT the name on the Letter Head. John Eager Howard Chapter. Chapter of What? the D.A.R., in Baltimore, Maryland. 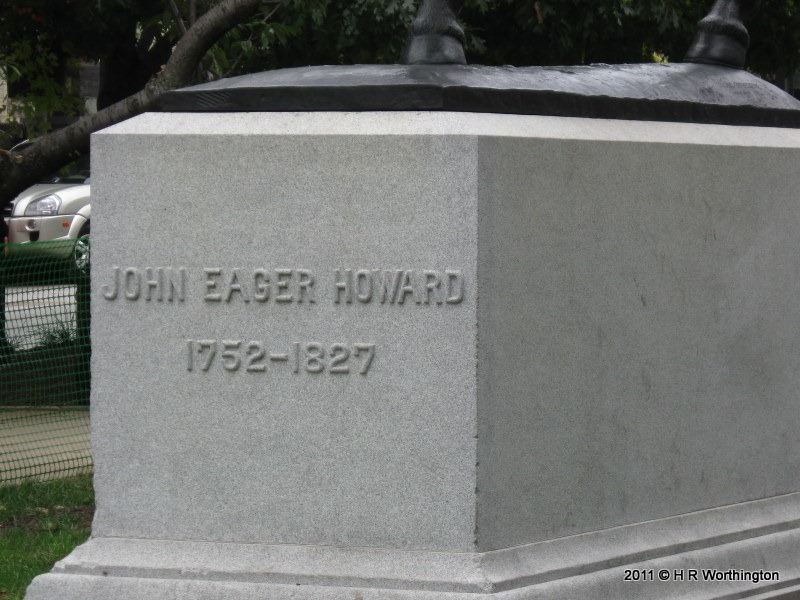 So, in searching the War of 1812, I found, or found again, an Ancestor, John Eager Howard, 3rd cousin, 6x removed. Why wouldn’t there be a DAR Chapter named after him. He did fight in the Revolutionary War. Must have been a real hero. 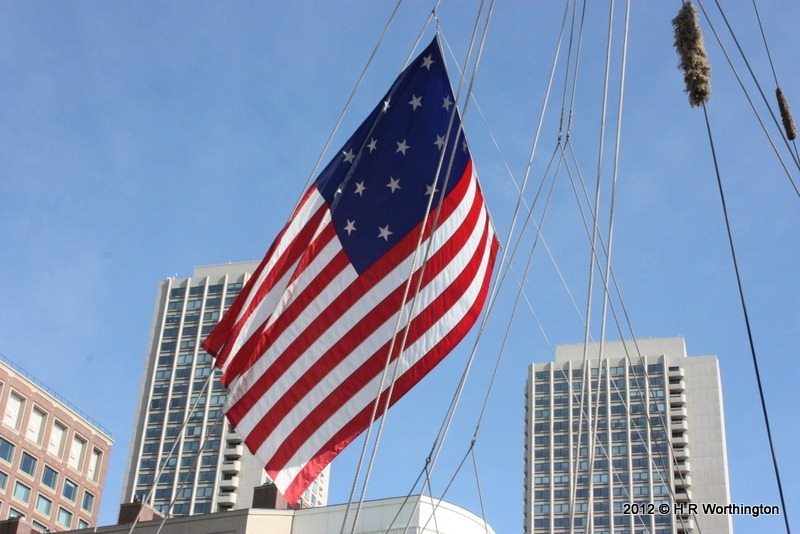 While aboard the Pride of Baltimore II earlier this week, I was reminded of an event that took place in the harbor of Baltimore in the War of 1812. Hadn’t really “connected the dots” between this was and a distant relative. 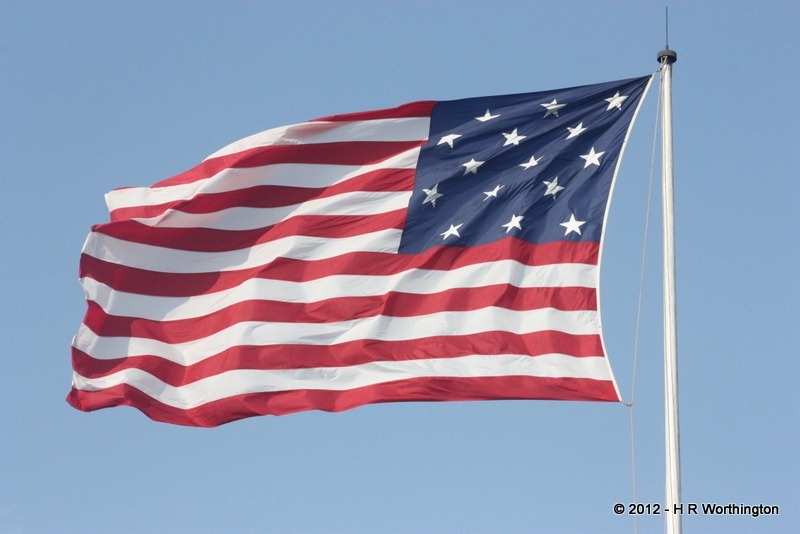 This is the type of flag that a ship like the Pride of Baltimore might have flown during the War of 1812. 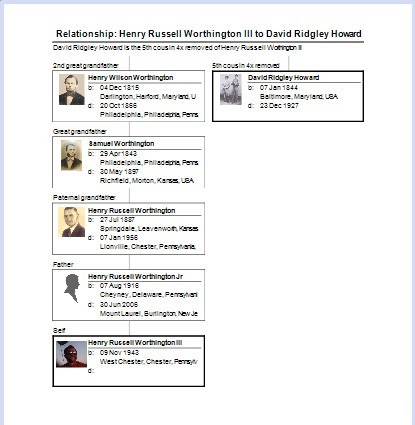 Last summer, I was researching one “Ridgely Howard” using the Inferential Genealogy of family research. Later in my research, Ridgely Howard was really David Ridgely Howard. 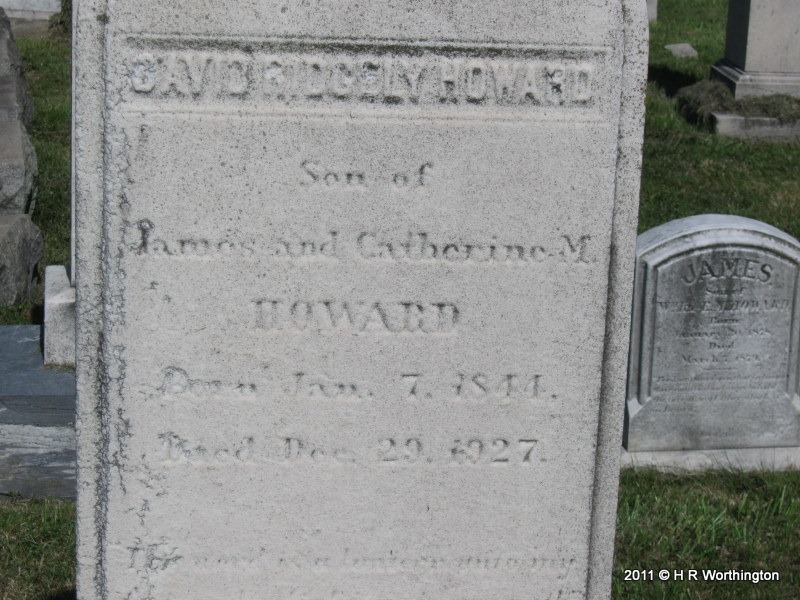 His grandfather, John Edger Howard (1752-1827) and his wife Margret Chew (1760-1824) had a number of children, one of which was James Howard, Ridgely’s father and Charles Howard. Charles had 10 children, one of which was also Charles. This Charles married Elizabeth Phebe Key. She was the daughter of Frances Scott Key (1779-1843).